This year will be my 12th PMC Challenge. 7th year for Kim (who has been with me for 32 of those 35 years) and Leah's 3rd. Through the years Team Chev has raised $100,000+! October of 1982 I turned 17 years old. I thought I had everything going for me. I just received my license two weeks prior, it's my senior year, I trained for the past 6 months with the goal of being one of the top wrestlers in the area, and top candidate for captain of the wrestling team. All I needed to do at that time was to pass a routine physical so I could wrestle. That physical changed my life forever. During my physical my doctor noticed suspicious lumps in my lower abdomen. I told him that they have been there for about 6 months and I dismissed it as a hernia. Within 24 hours of that appointment I had laid on an operating table to remove a mass. During recovery, our long-time family physician-friend came into my hospital room. He was obviously upset. He looked up at me and said, The news is not good, you have cancer. Not knowing what to say, I looked up and said Can I ask you a couple of questions? .....Does that mean I'm going to lose my hair?....... Will I be able to graduate with my friends? He reached over to hug me and said Tommy..... you have no idea, yes you will probably lose your hair. As he was hugging me, I thought to myself that he never did answer that second question. I had stage II cancer and was aggressively growing, with multiple nests of tumors that already spread into my lymph nodes. The prognosis was hopeful. I underwent another major operation which they cut an 18 midline incision for a lymph node dissection. During the operation they noticed a mass on my kidney, liver, aorta and vena cava. Following the operations they immediately started cycles of chemotherapy. The chemo was taking a toll on my body. When I got sick from my chemo treatments the burn in my abdomen was so painful, so unbearable from the operations, that I made a personal decision to stop eating than to go through that pain. I started this battle weighing in around 180 lbs. The time I was through I weighed less than 95lbs. Near the end of my treatments I requested to my parents that I wish to receive no more visitors. I felt that if I passed, I didn't want them to remember me as they saw me at that time. I'd be lying if I didn't tell you that there were nights that I hoped I wouldn't wake up the following day. But each morning I woke up and found a way to make it through that day. This battle lasted until spring of 1983. The physical and emotional scars I carry with me from this experience is something that I cannot describe. I graduated with my classmates in 1983. I was very fortunate to have an incredible medical team and great support from family and friends. The Spring of 2019 marks my 36th anniversary as a cancer survivor. I am more grateful than words could ever express. I was given a second chance in life. I have a loving/caring wife and 4 beautiful daughters that I was told I probably would never have, due to the operations and chemotherapy. However; this was all made possible by the many years of life-saving cancer research and treatments. Unfortunately the outcome is not the same for all, which is why research must continue. My mother died of cancer two days after my twins were born..... She never did get to see them... I've also lost my brother-in-law, aunts, cousins, grandmother and friends to cancer. I'm sure I could speak for all when I say that we all know someone who has been affected directly by cancer. 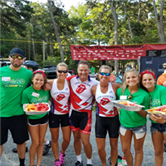 On August 3rd & 4th, 2019, we will be riding in my 11thh Pan-Mass Challenge to raise money for the research and treatments that go towards cancer. We will bike ride for two days, 192 miles from Sturbridge to Provincetown. The training and ride will be both physically and emotionally challenging for me. I will be riding to honor the loved ones that have I have lost, and to show that I am Living Proof! However; I have one more challenge. In order to participate in the PMC, we need to secure $15,000 in donations by August. So I need your support. Please donate to show your support that I'm Living Proof that with good research and treatments, that cancer is curable. .
Super Bowl LIII Squares. Thank You! "Ride On Team Chev" winning together with NE Patriots! !